We’re still amazed that we’re quickly approaching the official Holiday Season!! With Thanksgiving ONE WEEK away, we’re busy getting ready for a JOYFUL holiday season! Year after year, we LOVE making our clients (and soon to be NEW clients) HAPPY!! And this is IT!!! Our GiftCards are a great GIFT, but also a wonderful time to stock up on hours!! Cheers to that! ALSO…. 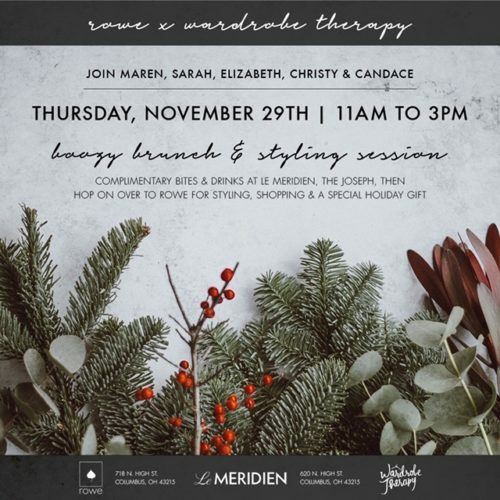 we have a Boozy Brunch & Styling Session coming up on Thursday, November 29 with Rowe and Le Meridien! 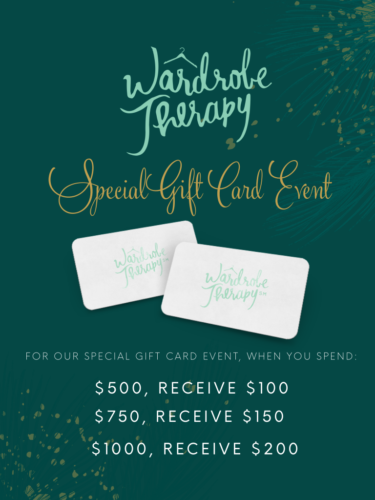 A perfect time to bring a friend, have holiday cheer and then join us for shopping and styling with Wardrobe Therapy and Rowe team at Rowe! A perfect Thursday in our books.